Intricate scalloped edges adorn this embossed glass candle - creating a captivating glimmer as our proprietary wax blend burns down. Founded in 1999 by Traci and Troy Arntsen, Voluspa has gone from ahomegrown labor of love to a state-of-the-art manufacturing facility in Southern California. Legend has it that the two built the brand from their ownruined pots and kitchen laboratory. Traci’s cultivated passion for botany and essential oils combined withher fragrance education, allows Voluspa to hand-craft scents using the finestglobal ingredients. Their revolutionary custom wax blend is the result of considerable sourcing, sustainability research, testing and testing again. 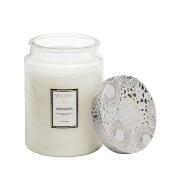 Voluspa is one of the first companies specialized in making candles to market coconut wax. This wax is made after collecting coconut and then cold pressed to harvest the coconut oil. This oil is then transformed into coconut wax by a hydrogenation process, identical to that used for soy wax. 2. Superb finish and a beautiful creamy white texture. 3. Contains a high level of fragrance. 5. Ecological and sustainable manufacturing without pesticides. 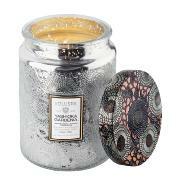 To enjoy your candle as much as possible, burn your candle until the surface is completely liquid. Do not burn candles for more than four consecutive hours. Never leave a burning candle unattended. Do not burn candles near pets or children. Keep the bits cut ½ cm before each use. If the wick develops a rounded tip, turn off the candle. Cool and remove the tip by pinching between the fingers with a cloth. Remove all flammable candle debris before burning. Do not leave pieces of burned wick or matches in your burning candle otherwise it could catch fire. To protect the container and avoid damaging the surfaces, do not burn your candle to the end, leave ½ cm of unmelted wax. Always burn candles on a flat surface that is heat resistant.